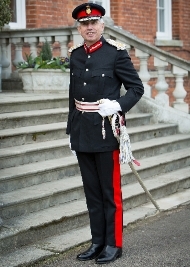 When representing The Queen and on certain other official occasions, male Lord-Lieutenants wear a military-style navy blue uniform with scarlet stripes on the trousers and a scarlet band round the peaked cap. Lady Lord-Lieutenants wear a Badge of Office rather than a uniform to indicate their position. 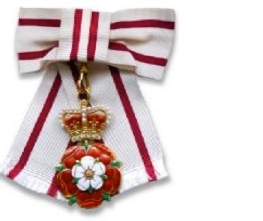 This badge features the Tudor rose surmounted with a crown on a bow of white and magenta – the Lieutenancy colours. Similarly male Vice Lord-Lieutenants wear a military uniform and female Vice Lord-Lieutenants wear a Badge of Office. The Lord-Lieutenant is The Queen’s personal representative in Berkshire. The Lieutenancy Officer is able to give advice on all aspects of protocols and procedures; please contact her by phone or e-mail. There is also detailed written guidance available to hosts planning a visit from the Lord-Lieutenant or his representative. 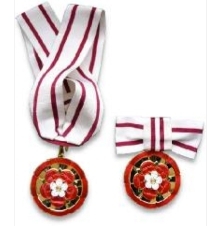 Where the Lord-Lieutenant is unable to attend he may be represented by his Vice Lord-Lieutenant or a Deputy Lieutenant, where the same protocols and precedence should be followed.